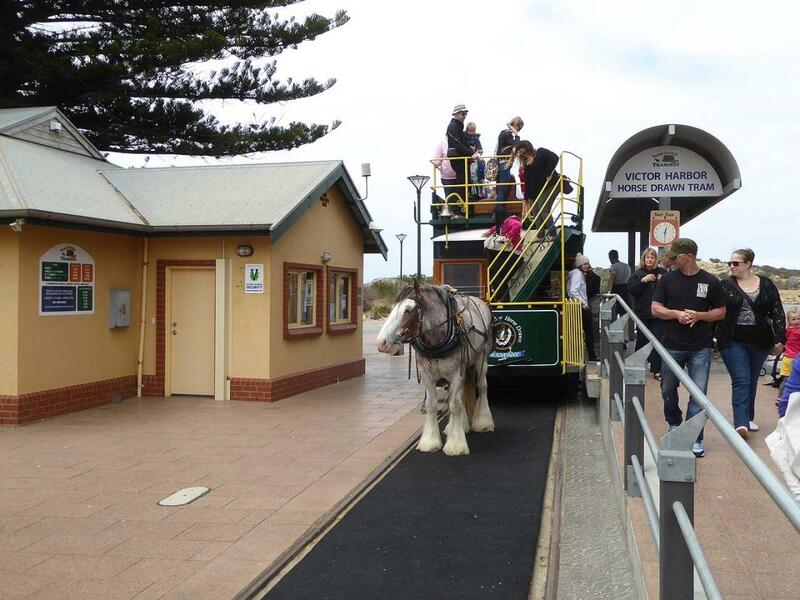 The Victor Harbor Horse Drawn Tram is located in the city of Victor Harbor, South Australia, Australia. The tramway links the visitor information centre in downtown Victor Harbor with the nearby Granite Island, running for half of its route over a 630 metres (2,070 ft) viaduct or pier, locally described as a causeway. The Victor Harbor Horse Drawn Tram is a service that began in 1894 to take passengers across the causeway to Granite Island. This is a reminder of olden days and is a leisurely way to travel the short distance from the Esplanade (near the Visitor Information Centre) to the island and the Penguin Centre. Tickets can be purchased from the driver or as part of the entry into the nearby SA Whale Centre. We climbed on board the horse drawn tram for the trip across to the Penguin Centre and then followed the walking track around Granite Island. There are some great views along the way but can be very windy. The Tram leaves every hour during the day and is heaps of fun for the kids - a unique experience. This is a very relaxing journey with great views. have you been to Victor Harbor Tramway? Explore Victor Harbor Tramway with RvTrips and find out where to stay, what to do and what to see. Helping caravan, motorhome and camper owners have a great holiday.